Gloves with Metallic Threads. 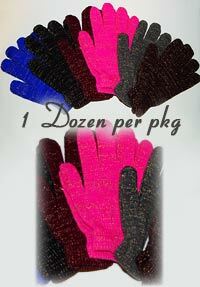 1 dozen stretch gloves per pkg. You will receive 2 of each color: Sapphire Blue, Black, Maroon, Hot Pink, Gray and Dark Brown. All have golden metallic threads woven throughout the glove. 1 size fits most. 90% acrylic and 10% lycra. Hand wash, air dry. Very cute as a gift basket addition or to make a Helping Hands gift package.